All Allyson and her friends want is a peaceful, grown-up evening of dinner and fun – a long-needed moms’ night out. But in order to enjoy high heels, adult conversation, and food not served in a bag, they need their husbands to watch the kids for a few hours … what could go wrong? Let me just say it briefly but powerful. I thought this was an insult to all current fathers who are portrayed again as incapable to raise children or watch over them for a while. Again there’s the image that a family life and the daily organization only can run smoothly when super-mammy is around. Let hubby take care of it and everything will end up in a chaotic mess. Sorry, but I think this is such a terrible outdated idea and again the subject of another “everything-goes-wrong” film. These days new terms like “The New Man” are used frequently so the idea being used in here, is kind of old-fashioned. And the statement that modern women can do a multitude of tasks simultaneously nowadays, is also a rarity. There are enough women who aren’t blessed with this multitasking feature. I also hate these kind of movies where everything goes wrong and it always seems like “Murphy” is at every corner waiting to interfere with the situation in such a way that everything goes haywire. I am a very huge fan of the sitcom “Friends” and have always looked at these episodes with pleasure. Except for one episode and that’s the one where Ross needs to give a speech and everyone gets terribly annoying so it looked as if it would turn into a disaster. In the end everything turns out just fine. That’s a recurring security in such films (and also in that particular episode of “Friends”). “Moms’ night out” also finishes in a corny way with a Christian message. Afterwards I was terrible dizzy and I was struggling to get my eyes back into position again. And this because the film constantly annoyed me and made sure I was turning my eyes around like hell in my eye sockets. The entire film can be summarized as follows. 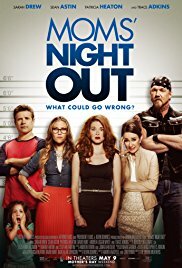 The highly stressed mother Allyson (Sarah “Greys Anatomy” Drew) urgently needs to take a break to let off steam (she’s not blessed with the multitasking option apparently) and asks her two friends, Izzy (Andrea Logan White) and Sondra (Patricia Heaton) to join her in a night out. Her husband Sean (Sean Astin who still looks like a hobbit) understands the situation and fully supports her. He’ll take care of the children that weekend along with his friends Kevin (Kevin Downes), who hates children, and Marco (Robert Amaya), who also could use some psychiatric assistance due to his chronic anxiety when it comes to childcare. And then the “Night out” starts and the accumulation of accidents, mishaps and misunderstandings begins. Even a summary of all extreme disaster movies of the last decade is nothing, compared to this catastrophic night. Everything goes wrong. And I mean literally everything. The performances aren’t that great either. However, this is not due to the performance of the actors themselves, but rather because of the created stupid, bland, banal cardboard characters with their dramatized and pathetic traits. The tensed mother, with a bunch of kids, who are portrayed as a gang of hooligans, who suffers from a cleaning illness and sees herself as a complete failure (she can’t even think of any content for her blog , the poor soul …). Her girlfriend, the wife of a priest, acts like a saint but ultimately it appears she has a more dissolute past. Sean is the typical loving man who always seems to understand his wife (but it turns out he doesn’t. And he’s not the only one …) and tries to take matters in hand, but ultimately looks pretty clumsy. His friends transform during the film into something they are not at the beginning. The only admirable display was of Trace Adkins as Bones. A kind of “Hulk Hogan” type who turns out to be the savior in distress. Even his moralizing speech afterwards (of which he doesn’t understand the impact) I could condone. A successful performance that managed to put a half smile on my face. And the last honorable mention: Manwell Reyes as the person in the tattoo shop.